Tesloop has been hitting the road to an absurd degree since it launched in 2015. Averaging approximately 17,000 miles per month on each car, it offers perhaps the best case study yet of what happens to a Tesla vehicle after a lot of driving. Its first car — and its only Model S, since the Model X is a fundamentally better vehicle for such service — just passed 300,000 miles of service. Such a figure could make a normal fleet manager shake in fear when thinking about the long-term fuel and maintenance costs, but for Tesloop and its Model S (named “eHawk”), the response is: meh. Furthermore, the bulk of that cost was just scheduled maintenance fees ($6,900). Another $3,500 was to repair a headlamp after the car drove through deep water — my guess is that the driver had the Lotus Esprit Easter egg turned on and forgot that the car wasn’t actually a James Bond submarine car. Yes, it seems those two items accounted for all of the eHawk’s “maintenance and fuel” costs, which would indicate that the car didn’t spend a dime charging (aside from whatever Tesla priced into the car for Supercharger access). If this sounds like an insanely low maintenance and fuel cost for 300,000 miles of driving, that’s because it is, especially for a car in this class. “Had this been an Mercedes S class, the scheduled routine maintenance and fuel would have been $86,000 ($52,000 maintenance and $36,000* fuel) with 112 days of servicing, or for a Lincoln Town Car $70,000 ($28,000 maintenance and $42,000** fuel) with around 100 days of servicing,” Tesloop writes. The Tesla Model S was in the shop for just 12 days. Naturally, these benefits are some of the things that stimulated a few other cleantech fanatics and me to start up Tesla Shuttle in Europe. As I indicated just the other day, we spent approximately $70 on charging over our first 17,000 kilometers. 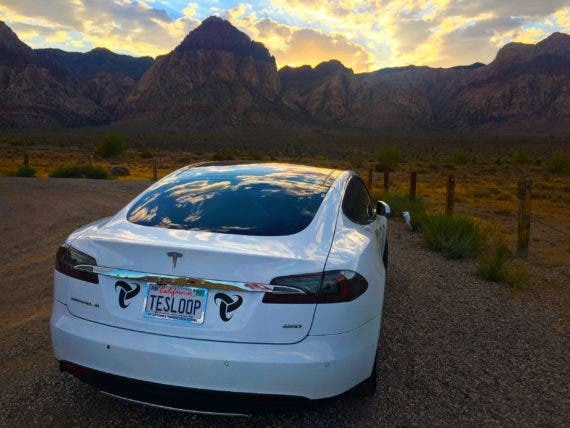 Thanks to Tesloop for leading the way! I’ll just close with one broader statement, since I got a little bit of pushback on my article about our first 17,000 kilometers, even being called a “leech” by one person. It’s easy to see one of our car’s or Tesloop’s eHawk as just “one customer car,” but the fact of the matter is that we are driving many customers in electric Tesla vehicles instead of gas cars and airplanes. 300,000 miles served how many customers? Only Tesloop knows, but the point is that this one car prevented approximately 300,000 miles by gasmobile or airplane. If you take a US driving average of approximately 13,500 miles a year and assume two full years of service in the eHawk, that’s sort of like replacing 22 other cars. Naturally, that’s not a perfect way to look at it, but you get the point. Congratulations to Tesloop, and to Tesla for creating such a superb vehicle at just the right time. Related: It’s The Batteries, Baby!